Aston Villa maintained their unbeaten start in the Premier League to move up to third with victory against Hull at Villa Park. Gabby Agbonlahor's turn and shot opened the scoring on 14 minutes and Andreas Weimann slotted home from 10 yards. Hull hit back after the break when Nikica Jelavic's header deflected in off Villa defender Aly Cissokho. 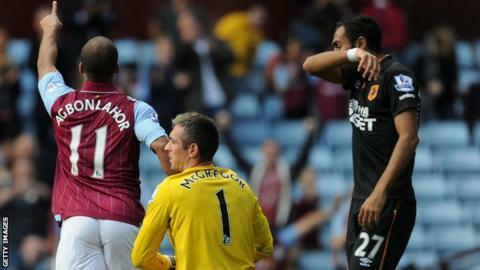 The Villans finished the match with 10 players when Ron Vlaar went off injured after 90 minutes, but held on to win. Both sides headed in to the game looking to bounce back from midweek cup disappointment. Hull's defeat on away goals by Belgian club Lokeren ensured that their first foray into Europe was painfully brief, while Villa lost at home to League One Leyton Orient in the League Cup. Villa began with more urgency and Fabian Delph rattled the crossbar with just two minutes gone. The midfielder, who was called up to Roy Hodgson's England squad this week, collected a through-ball from Weimann on the left and beat Allan McGregor with a shot from a tight angle, but not the woodwork. However, former England man Agbonlahor was more clinical on 14 minutes when, after a lay off from the energetic Weimann, he turned in the box to fire home a right footed shot into the bottom left corner. It was Villa's first goal since Weimann's strike in the opening day 1-0 win at Stoke and settled the nerves of Lambert's side. There was a buzz around Villa Park as the home side enjoyed large spells of possession and on 36 minutes Weimann grabbed the goal his performance deserved. The Austria international calmly slotted home from 10 yards after Kieran Richardson had picked him out with a cut-back from the left flank. With last season's top scorer Christian Benteke, who netted 10 times in the Premier League, out injured, Villa had been struggling for goals this term, but that was not obvious in a free-flowing and attacking first-half performance. The Tigers lost 13 away games last season - only relegated Norwich (14) fared worse. Hull looked to be showing the physical and mental strain of their Europa League exit and struggled to impose themselves. Steve Bruce made tactical changes for the second half, bringing on full-back Liam Rosenior for centre-back Curtis Davies and switching from a back three to a back four. The Tigers threw on Robert Brady, who scored twice against Lokeren in midweek, 10 minutes later as Tom Ince made way. Brady quickly made a difference and it was from the Irishman's free-kick that Hull struck back after 74 minutes, when Jelavic's header deflected off Cissokho and past Brad Guzan. Hull stepped up the tempo and Jake Livermore stung the hands of Guzan with an effort from the edge of the box moments later. Villa conceded 29 goals at home last season, their worst tally in the Premier League, and dropped deeper and deeper as Hull pressed for an equaliser. It was a nervy finale for Villa, who had to play out added time with 10 men after centre-back Vlaar limped off injured with all three substitutions made, but Lambert's side held on for their second win of the season. Aston Villa manager Paul Lambert: "After the first half we should have been out of sight. The second half we were under pressure, but the first half set the tone of the game. "You are never going to dominate a game for 90 minutes. But we deserved to win. "Agbonlahor was outstanding, but in general the whole team performance was excellent. "Vlaar has injured his calf. We will see how he is, but he has two weeks to recover [during the international break]." Hull manager Steve Bruce: "The performance in the first half was the worst I can remember in the time I've been at the club. For the travelling supporters who witnessed it, you have to apologise. "There was no energy, no spirit. We never laid a glove on them. "In the second half, we changed it round, and we were excellent. But we gave ourselves a mountain to climb after the first half." Match ends, Aston Villa 2, Hull City 1. Second Half ends, Aston Villa 2, Hull City 1. Delay in match Ron Vlaar (Aston Villa) because of an injury. Attempt saved. Sone Aluko (Hull City) left footed shot from the left side of the box is saved in the centre of the goal. Assisted by Nikica Jelavic with a headed pass. Attempt missed. Darren Bent (Aston Villa) right footed shot from the right side of the box misses to the left. Assisted by Ashley Westwood. Brad Guzan (Aston Villa) is shown the yellow card. Offside, Hull City. Michael Dawson tries a through ball, but Nikica Jelavic is caught offside. Corner, Hull City. Conceded by Philippe Senderos. Stephen Quinn (Hull City) is shown the yellow card for a bad foul. Foul by Stephen Quinn (Hull City). Jack Grealish (Aston Villa) wins a free kick in the defensive half. Offside, Aston Villa. Ashley Westwood tries a through ball, but Darren Bent is caught offside. Substitution, Aston Villa. Darren Bent replaces Gabriel Agbonlahor. Nikica Jelavic (Hull City) is shown the yellow card for a bad foul. Attempt missed. Sone Aluko (Hull City) left footed shot from outside the box misses to the right. Assisted by Stephen Quinn. Corner, Hull City. Conceded by Brad Guzan. Attempt saved. Jake Livermore (Hull City) right footed shot from outside the box is saved in the top right corner. Assisted by Sone Aluko. Attempt missed. Fabian Delph (Aston Villa) left footed shot from outside the box misses to the right. Attempt missed. Paul McShane (Hull City) header from a difficult angle on the right is too high. Assisted by Robbie Brady with a cross following a corner. Corner, Hull City. Conceded by Carlos Sánchez. Foul by Andreas Weimann (Aston Villa). Andrew Robertson (Hull City) wins a free kick in the defensive half. Foul by Liam Rosenior (Hull City). Substitution, Aston Villa. Jack Grealish replaces Kieran Richardson. Goal! Aston Villa 2, Hull City 1. Nikica Jelavic (Hull City) header from the centre of the box to the top left corner. Assisted by Stephen Quinn with a headed pass following a set piece situation. Sone Aluko (Hull City) wins a free kick in the attacking half. Offside, Hull City. Jake Livermore tries a through ball, but Sone Aluko is caught offside. Substitution, Hull City. Sone Aluko replaces Tom Huddlestone. Attempt missed. Liam Rosenior (Hull City) right footed shot from the right side of the box is too high. Assisted by Robbie Brady. Foul by Paul McShane (Hull City). Substitution, Aston Villa. Carlos Sánchez replaces Charles N'Zogbia.